123 pages. Hardcover with dust jacket. This exhibition catalogue was published on the occasion of the exhibition Martin Kippenberger The Raft of Medusa with an accompanying text by Rachel Kushner. 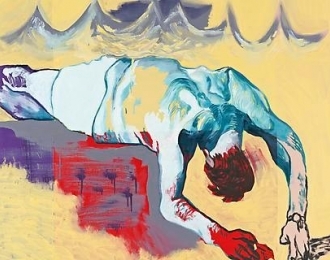 Skarstedt presents the first comprehensive exhibition of Martin Kippenberger's The Raft of the Medusa series in New York. Organized in collaboration with the Estate of Martin Kippenberger, Galerie Gisela Capitain, Cologne, the show is dedicated solely to this exceptional body of work. The exhibition is a multi-media presentation including paintings, drawings, photographs and a carpet from the series. The Raft of Medusa will be on view at Skarstedt (20 East 79th Street) from March 3 – April 26, 2014. Featuring paintings from the Estate of Martin Kippenberger, as well as public and private collections, the exhibition demonstrates the breadth of the artist’s creativity in this singular body of work. The range of paintings and source materials include 16 paintings, 19 drawings, 15 lithographs, 9 photographs and a 8 by 15 foot woven rug which depicts a blueprint of the raft.